Download and Install WebConnector: Intuit makes a product called WebConnector. WebConnector communicates with your QuickBooks and then communicates with your PrestaShop site through our “QuickBooks Sync module“. First you will need to download and install WebConnector. Go to http://marketplace.intuit.com/webconnector/ and choose the correct version for you. Open the QuickBooks Web Connector from the Window’s Start menu. Now you will need to add the QWC file that you previously downloaded from you Prestashop Website. To do this click on the “Add an application” button and then select the QWC file that you downloaded from your PrestaShop website. After selecting the QWC file you will be asked for permission and your website security certificate will be checked. Select the option for allowing access whenever QuickBooks POS is open and continue. The first time you exchange data between QuickBooks and your website using Web Connector, you will need to select the checkbox to the left of the Application (QWC File), enter your password, and then click the Update Selected button near the top of the Web Connector dialog. note: your Password is Case Sensative… make sure you enter it correctly! Click Yes if asked if you would like to save the password. The service will then start running. This may take a minute or two to complete depending on how many products and orders you are processing. A display will pop-up that gives you a status and progress indicator. Every time data is exchanged successfully you’ll see green text and if there is an error, you’ll see red text in the Status block. To manually sync, select the checkbox to the left of the Application (QWC File) and then click the Update Selectedbutton near the top of the Web Connector dialog. The service will then start running. This may take a minute or two to complete depending on how many products and orders your are processing. A display will pop-up that gives you a status and progress indicator. Every time data is exchanged successfully you’ll see green text and if there is an error, you’ll see red text in the Status block. You can reduce the Web Connector down to the tray. It will still be running and if the Auto-Run is enabled will still run in the back ground. 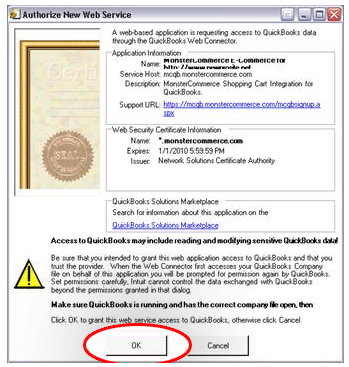 If you would like Web Connector to automatically sync your STN website with your QuickBooksPOS, you will need to select the checkbox to the left of the Application (QWC File), check the Auto-Run box, enter an interval (in minutes) in the Every_Min field, and then click the Update Selected button near the top of the Web Connector dialog. For example, to sync every 5 hours, check the Auto-Run box and enter 300. You should NOT set your schedule for anything less than 30 minutes! Depending upon your data size, this could cause the sync to over-run your available bandwidth. Over running your available bandwidth with your host provider may cost you. Note: Web Connector must be running for automatic sync to work. If you restart your computer or QuickBooks POS, make sure you restart Web Connector as well. QuickBooks Company File Name: WebConnector doe’s not like special characters as well as spaces in the company file name. You can change the company file name by going to “File >>Company Operations” in QuickBooks. This will let you rename it to something less problematic. Single User Mode: In order for WebConnector to communicate with you company file QuickBooks must be in Multi-User Mode. Intuit’s WebConnector is basically a user connecting to your QuickBooks. SSL Certificate: Intuit’s WbeConnector requires that your site have a valid SSL certificate. From our experience we have not been able to get a self-signed certificate to work. Bandwidth Usage: Running WebConnector takes up bandwidth. If you have a limited amount of bandwidth (restricted by host provider and possibly ISP) and you have automated updates going every few minutes as well as your QuickBooks company file has lots of records you can use a lot of bandwidth. Depending on your host provider this could mean extra charges to you. We estimate that for every 500 products in QuickBooks it will use 1 MB of bandwidth. So if you are a retailer that has tens of thousands of products in your QuickBooks and you run the sync regularly then you could start eating up your bandwidth pretty fast. Here is a helpful formula you can use: Number of products in QuickBooks divided by 500 = bandwidth used for each sync. Now if you have “Auto-Run” enabled in WebConnector take that number and multiply by the number of times WebConnector will get run in a 24 hour period and then take that number and multiply by 30 and that will give you how much bandwidth you will use in a month which is what most providers charge you for. As an example let’s say I have a store that has 8,000 products in QuickBooks (does not matter if there is stock or not) and I want to run sync every hour. My formula would be 24 x (8,000 ÷ 500) x30 = 11.24 gigs! That is a lot of bandwidth! So please be aware of what price you will be paying if you are wanting to run “Auto-Run” and have lots of products. WebConnector QWC “Remove”: WebConnector can be finicky to say the least. If you change your company file name in QuickBooks after already adding a QWC file that looked to your old name then you will get errors and will not be able to add or remove the mis-matched QWC file. To remove the mis-matched QWC file you will need to rename your QuickBooks company file to match what was defined in the QWC file.